Sure, working out can help you fit into an old pair of jeans or give you a set of killer biceps, but it's also the ideal stress-buster — and few things are more vital to your health than that. "Exercise is the ultimate stress management tool, because it lowers your cortisol levels, which in turn, relax your muscles and make your brain feel good," says Mia Finkelston, M.D., a family physician who treats patients via LiveHealth Online. "In addition to increasing serotonin levels, which can help combat depression and anxiety, working out also produces endorphins, which are like your own personal bag of happiness." Though most any physical activity that gets you moving and boosts your heart rate will help combat stress (especially if it's also something you enjoy doing), here are seven of the best stress-relief workouts. Your sanity will thank you. Few things can melt away the stress of a long day like strapping on a pair of sneakers and hitting the pavement. "Running is meditation in motion," says Josh Emdur, M.D., medical director of SteadyMD Running. "We live in a world filled of distractions and running allows us to filter out the noise and just be present. Doing targeted workouts such as hill repeats, intervals or fartleks will help keep you focused and in the zone." And if you're not one for completely tuning out the world, buddy up. "Humans are social, communal creatures," Dr. Emdur says. "While running solo can relieve stress, most runners would agree that a social run with friends is one of the best ways to unwind." How to Get Started: Like anything in life, it's impossible to go from novice runner to marathoner over night, so start small. Take a jog around the neighborhood — or even walk — and build from there as you increase your endurance. You can also switch from walking to running, working up to a set running goal. Just be sure to wear comfortable sneakers and have plenty of water on hand. Though this one seems like a no-brainer to be included on this list, that's for a good reason. It really is one of the best stress-busting activities around. "Yoga has been studied as a set of tools for stress management and has been found to be incredible effective," says Baxter Bell, M.D., author of Yoga for Healthy Aging. "The tools most commonly used are the poses, breath work and meditation techniques." Bell says one reason yoga is so effective at combatting stress is by lowering the sympathetic nervous system activity — a.k.a. the fight or flight response. "Yoga tends to bring our nervous system into better balance, which results in an overall greater sense of well-being." How to Get Started: Most studios offer beginner classes, which teach basic poses. But if you're feeling shy about your Downward Dog, there are tons of beginner yoga videos online. Typically, Hatha yoga classes are good for burgeoning yogis, since they're slower-paced. Vinyasa, Ashtanga and Bikram classes (which can be heated up to 104 degrees) are good for when you've got the basic moves down. And when you're starting out, it's a good idea to have props, such as yoga blocks and a yoga strap, to help perfect your form. It shouldn't come as too much of a surprise that both boxing and kickboxing have been proven to pack serious stress-relieving punches. A 2014 Japanese study found that, after completing a boxing fitness program, participants had a significant decrease in tension-anxiety, depression-dejection, anger-hostility and confusion. The reason? The endorphin-producing, sweat-inducing workout is an ideal outlet for getting — er, punching — out life's little (and not-so-little) frustrations. And no, you're not a bad person for imagining your boss as the punching bag. How to Get Started: Some boxing and kickboxing classes are more intense than others, so find one aligned with your personality and fitness level. Research classes in your area (you can even observe a class), and be sure to tell your instructor that you're new. Most kickboxing gyms provide equipment, but some may require you to bring boxing gloves, ankle supports and headgear. For class, wear comfortable clothing that's not too loose and be sure to have plenty of water nearby. At some point in your life, you've probably attempted to shake off a bad day by blasting a little Beyonce. And did it work? Probably at least a little. To take stress-melting to the next level, though, add movement to your beats. In addition to helping you sweat and produce feel-good hormones (and, let's be honest, it's just plain fun), dance is a physical form of self-expression — in other words, you're able to release tension you've been bottling up in a unique and personal way. A 2014 study in The Arts in Psychotherapy found that just one upbeat dancing session can help combat depression and anxiety more effectively than simply listening to music or even vigorously exercising. How to Get Started: One of the great things about dancing is that it's subjective. In order for it to be effective as a stress management tool, you don't need to shell out big bucks for a gym or undergo training. Simply cranking up the tunes while you're cleaning the house can do wonders for your mood. That said, if you want to take a more formal approach, line dancing classes — which are no longer reserved strictly for country music — are a good way to go, as the movements are repetitive, so they're easy to grasp. Pilates has been around for almost a century, but the health — and stress-busting — benefits still hold true today. 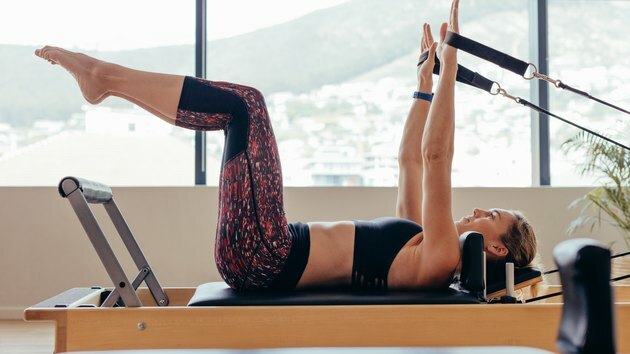 By combining breath and core work with motion and strength-building movements, Pilates is a total mind-body workout (think yoga meets aerobics). A good option for newbies to the workout world, Pilates will help decrease stress, alleviate shoulder and neck pain and strengthen the immune system — as well as your core. How to Get Started: If you can swing it, a private Pilates class is ideal for learning the basics and working on your form. If that's not feasible, though, start with a basic mat class (not a Pilates class that involves equipment, such as reformer classes) or look for an introductory class online or through a fitness app. When you're first starting out, the only thing you should need is an exercise mat. Originally developed for self-defense, tai chi has evolved into one of the most tried-and-true methods for stress management. Like yoga, tai chi is a form of moving meditation, which helps decrease tension and promote serenity through a series of graceful, flowing movements and focused breath work. Slow-paced and low impact, tai chi is perfect for people whose main fitness objective is mental well-being. That said, don't be fooled by tai chi's seemingly mild manner: This ancient art form also greatly improves flexibility, balance and strength. As an added bonus, tai chi has been linked to better sleep and pain management. How to Get Started: There are many "tai chi basics" videos available, but to learn proper form and breathing techniques, a certified instructor is the best way to go. It's also helpful to have some knowledge of meditation or mindfulness techniques, as both are often incorporated into the practice. Whether you're just starting out with a fitness routine or are looking to add something low-impact (and leisurely) to what you've already got going on, walking is a great exercise — and it comes with a host of health benefits, including stress reduction. Something to keep in mind, though: Make sure your walks are text- and Instagram-free. "The simple act of mindful breathing during exercise can help reduce overall stress levels and help you experience a better night's sleep," says Dr. Finkelston. "Whether you're running or walking — anything that gets you moving — just the simple change of scenery and break from your typical routine is extremely beneficial." How to Get Started: Are you looking for a post-work cruise around the city in order to transition out of "office mode"? Or does an early morning jaunt around your neighborhood, where it's just you and the birds, sound more appealing? The only way to discover your ideal walking scenario — i.e. which works best for alleviating stress — is to test out different options.